Ok, so you passed you Comptia A+ exam. Welcome to the club. 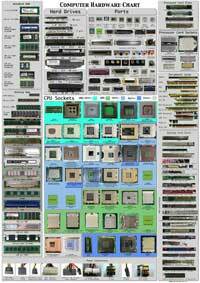 Let me suggest that you print out this hardware chart. Trust me, it will come in handy. No matter how much of a hardware geek you are, there is no way you can name by sight alone the different types of CPU sockets or some of the more obscure types of RAM. There is nothing wrong with having this cheat sheet in your toolbox or on your flash drive. It will only help you get the job done quicker. Oh, and large size prints are available for all you teachers and computer repair shops out there.